If you’re a member at Guts Casino you’ve probably seen the big Christmas promo during December with great gifts. This campaign was a huge success at Guts and therefore the team at the casino has developed a new fun casino promo called “New Year’s Resolution”. Throughout January you will be able to join this campaign if you want the chance to grab some free spins. And as always Guts offers bonus spins completely free from wagering requirements which means that you will be able to make a withdrawal whenever you want to. We can also tell you about the weekly promo called “Thursday Triple” that will give you free rounds throughout the weekend. As from today, the 12th of January, you can join the new promo at Guts if you want to. 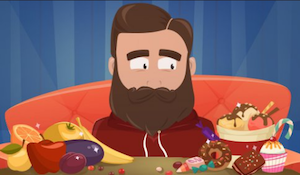 The goal is to collect up to 15 doughnuts in order to claim free spins spins on selected games. As soon as you log in or register a new account you will see a progress bar. By playing your favorite casino games at Guts you will fill up this bar eventually and when you’ve filled it completely you will earn a doughnut. When you get your doughnut you will get to choose a special New Year’s Resolution connected to a specific casino game at Guts together with free spins. After that you will be able to fill the bar again and get another doughnut with more bonus spins. There are 15 doughnuts up for grabs at Guts and if you collect them all you will also receive a mystery prize. The prize is a secret until you get all the doughnuts! As we mentioned in the beginning you can secure free spins throughout the weekend. Just choose the promo “Thursday Triple” and make a deposit. You can choose between two options. If you deposit between £20 and £49 today that you wager before 23:59 tonight you will get 10 free spins a day on Friday, Saturday and Sunday. But if you want a little more you can deposit at least £50 that you wager today. Then you will get 20 free rounds a day instead during the weekend. Since all of the bonus spins are free from wagering you can make a withdrawal right away. If you want a great start every week there’s another weekly promo at Guts. Every Monday you will be able to make a deposit using the bonus code DOUBLE. Then you will get 40% extra up to £40. When you deposit at least £20 that you wager you will also receive 15 free spins on a selected videoslot on Tuesday.